Genes have become the “fall guy.” They are the “go to” excuse for disease, disability and eventually death. Truth is, genes are not the final determining factor of your level of health and longevity. It is imperative to understand that it is normal for the body to be healthy and well. Research and ongoing studies continue to reveal that genes are influenced by their environment…and that environment is quite simply…you! 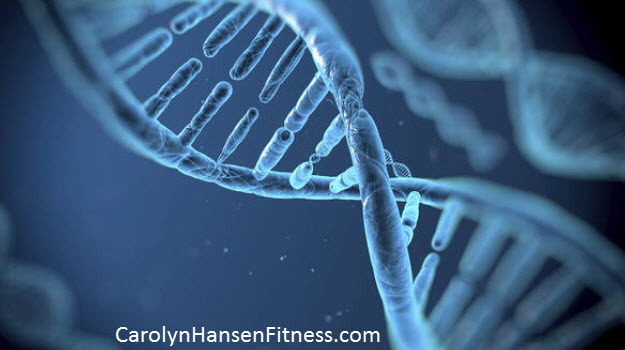 The way you conduct your life on a daily basis in terms of how much exercise you get, what types of food/fuel you feed your body, your sleep patterns, stress levels and other habits actually change the environment of your genes and that in turn changes what they do. Which ones are switched on and which ones are switched off is totally influenced by you and the environment inside your body. For example, certain genes can actually make you prone to inflammation which damages cells, tissues and organs and hastens the aging process which is the gradual deterioration and degeneration of function at the cellular and organ level and oxidation which is a process akin to “rusting” of the body. It really does not matter much what your current health condition is at the moment. The only thing that matters is that you do have the power to build a strong, healthy body that provides optimal disease protection by adopting healthy lifestyle habits. This empowers you to give your DNA a makeover, a second chance of sorts. You begin to shift your life away from disease rather than attracting it. The keyword here is “you.” You must stop looking outside of yourself for solutions to issues that can only be permanently solved within…your mindset, your beliefs, your perceptions and your actions. Health-care is really only “self-care.” Only you can build that powerhouse body…one that is strong, fit and lean. A vibrant, healthy body with optimal disease protection. Don’t wait for disease to set in…be proactive and take actions steps to improve your health every day; take time to exercise and feed your body the right fuel so that your immune system is working at peak performance. The focus needs to be you…not anything outside of you. You can reshuffle your genetic deck in your favor with healthy behaviors and reduce the likelihood of a bad outcome reducing your disease risk by a whopping 80 percent. You are the empowered one…not the doctor, nor the supplement. Neither can come close to offering you such powerful results. You do have the ability to be disease proof and add years of quality living to your lifespan, but you must embrace and learn certain skills. However once you learn those skills you have them for life. Take back control and quit giving your power away to “shiny objects” outside of yourself that are temporary “Band-Aids” at best and give yourself the gift of life instead. It’s time to commit to making the proper changes needed to fully protect yourself from preventable “lifestyle” diseases and reap the benefits of health and longevity. The combination of extended years and more life in those years is truly the best gift you can give yourself. No one will ever care as much as you do about your own health, vitality and well-being. Remember, it is far easier to keep good health than try and recover it after it is lost. Make this your motto and remind yourself of this fact every day. Focus on living up to your full potential to optimize your health and wellness regardless of age…rather than trying to run from inevitable disease. Now is the time to take command of your life to avoid disease somewhere down the road. Isn’t it time to throw away all the false statements you’ve accepted about dieting and exercise and learn what it really takes to stay healthy and fit long into your senior years?